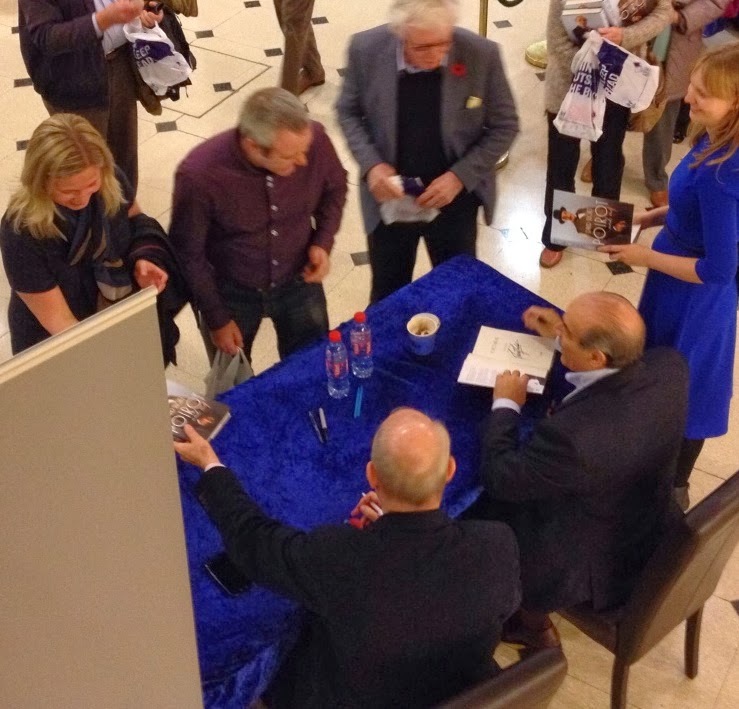 This is a very special blog post! Screenwriter and actor Ian Hallard kindly offered to do a Q&A on the process of adapting Agatha Christie's Poirot stories for television. He has co-written The Big Four (2013) with Mark Gatiss, and acted as a script associate on the other adaptations Gatiss has scripted, Cat Among the Pigeons (2008) and Hallowe'en Party (2010). He also played Edmund Drake in Hallowe'en Party, and appeared in a cameo as Mercutio in The Big Four. This Q&A offers a rare glimpse behind-the-scenes of the television series we all love. A big thanks to Hallard for taking the time to do this! SPOILERS on Cat Among the Pigeons, Hallowe'en Party and The Big Four follow. Don't read on if you haven't seen the adaptations. 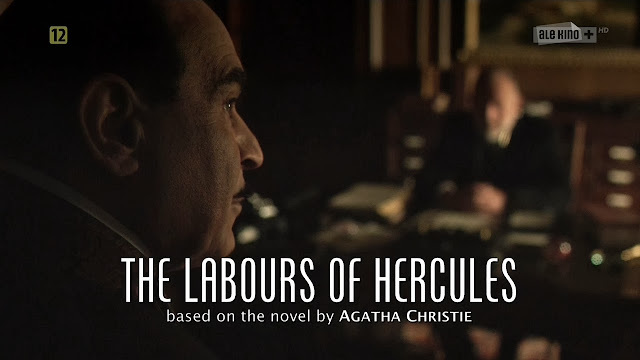 A frame-by-frame look: Polish trailer for 'The Labours of Hercules'! Labours of Hercules airs tomorrow in Poland, and a trailer has finally been released. ITV also released a press pack today (finally!). By the way, this won't be spoiler-free, so if you don't want to know anything - look away now. If you do, then you should read the press pack synopsis as well, because that will help you understand the screencaps. This episode was based on the novel The Big Four, first published in 1927. It was adapted for television by Mark Gatiss and Ian Hallard, and directed by Peter Lydon. This episode was based on the novel Elephants Can Remember, first published in 1972. It was adapted for television by Nick Dear and directed by John Strickland. This was the last Poirot novel that Agatha Christie wrote (Curtain was written in the 1940s). It's not her most successful novel. It's been criticised as rambling, chatty and out of focus. Some even suggest that it shows early signs of Alzheimer's. With this in mind, Nick Dear faced a challenge. He needed to re-structure, trim and re-focus the plot and make it work as two hours (or 89 minutes, to be precise) of exciting television. I think he has been reasonably successful. Let's look at the obvious changes first. Obviously, the setting is moved from the 1970s to the 1930s. In fact, that makes hardly any difference. Yes, there are a few references to post-war objects and events in the novel, but the main plot could easily be set in the 30s. A much more significant change, however, is to introduce a new subplot. Dear decides to flesh out a backstory that involves Dr. Willoughby (who was in the novel for a chapter). 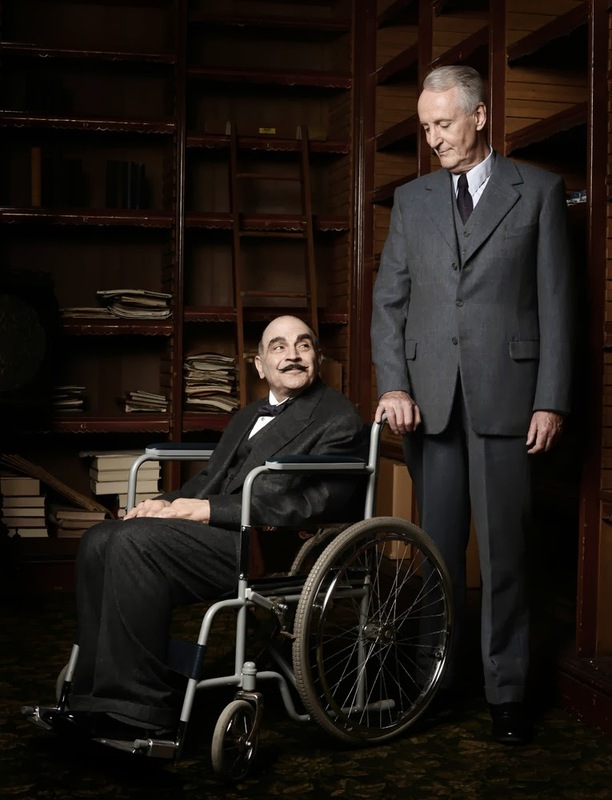 His elderly psychiatrist father (who was dead years ago in the novel) is found murdered in the basement of the Willoughby Institute, and Dr. Willoughby appears to be the only viable suspect. 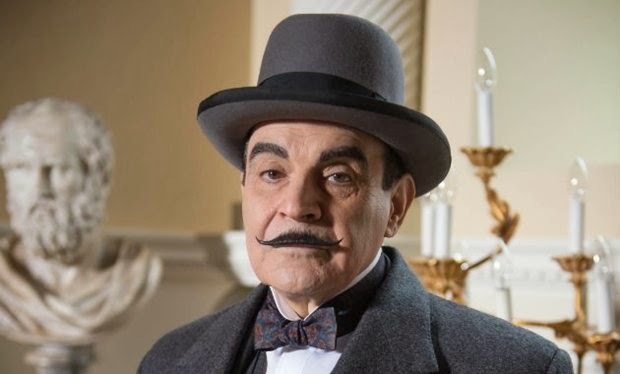 Dear also makes him a longtime friend of Poirot's. 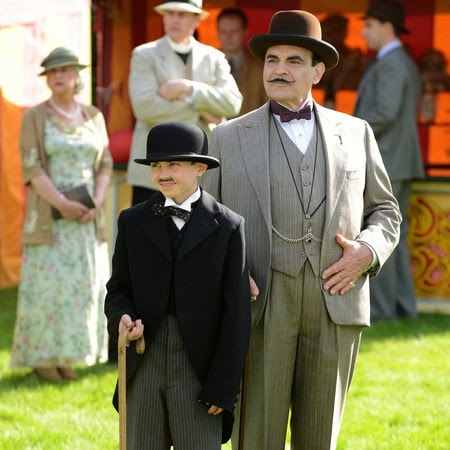 Someone suggested online that Poirot had been brought out of retirement in this episode, but this fact proves that he is still just taking cases that (a) interest him or (b) concern friends of his (Mrs Oliver gets him involved with the 'elephants', Willoughby with the death of his father. I think that's why Dear decided to make him a friend of Poirot's in the first place. The same goes for Inspector Neale, who is investigating the case. (He seems to partly substitute Superintendent Spence here, which is a shame, but the reason could be availability issues I suppose). 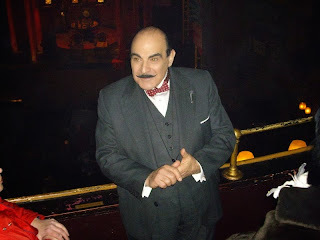 Poirot was never really retired anyway (apart from the Ackroyd case), he has just entered a state of semi-retirement (which is in keeping with the later novels). I think The Labours of Hercules, due to be broadcast soon, will probably see him entering retirement for good. But back to the subplot. Dear adds an 'American' secretary/lover for Dr. Willoughby (later revealed to be Canadian, thanks to some fairly obvious hints in the script), and even ties the Institute and Dr. Willoughby's practise to the backstory of Desmond Burton-Cox. 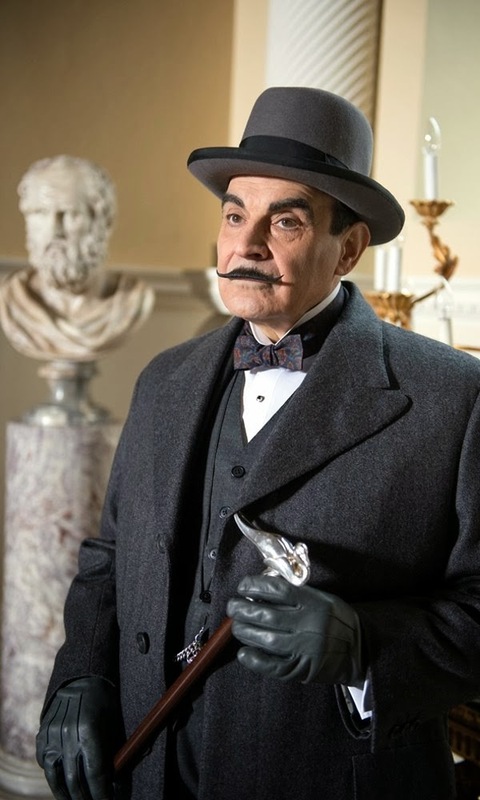 Poirot is only too keen to investigate the Willoughby case - so keen, in fact, that Mrs Oliver has to manage the 'elephants' case more or less on her own for about half the episode (which is a good thing - I'll come back to that later). This episode was based on the novel The Clocks, first published in 1963. It was adapted for television by Stewart Harcourt and directed by Charlie Palmer (son of Geoffrey Palmer, who plays Vice Admiral Hamling in the adaptation). Harcourt, who also scripted Murder on the Orient Express, is admirably faithful to the source material here. The most significant change, perhaps, is to set the adaptation in the late 1930s, directly preceding the Second World War. It's both a necessary and a wise move. 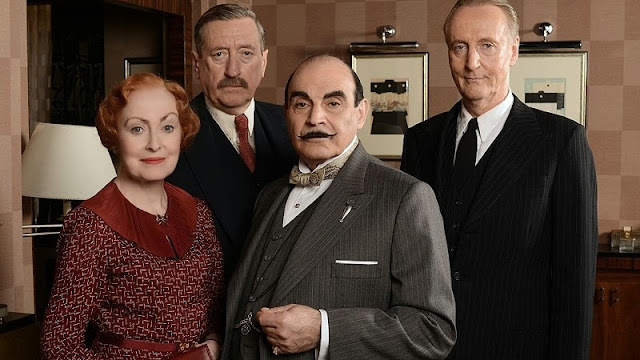 It's necessary because of the production team's creative decision to keep Poirot in the Thirties, and it's wise, because the transition of an essentially 1960s spy novel into pre-war espionage is seamless. The setting is Dover, and Dover Castle is a perfect backdrop for this pre-war story (reminiscent of Foyle's War's Hastings at times). Another change that's also dictated by the series itself is the decision to change Colin Lamb's name to Lt. Colin Race and make him the son of Colonel Race. In the novel, Christie implies that Colin might be Superintendent Battle's son ('Lamb' is a cover), but since Battle was never introduced to the television series; he was deleted from Cards on the Table and replaced by Superintendent Wheeler. 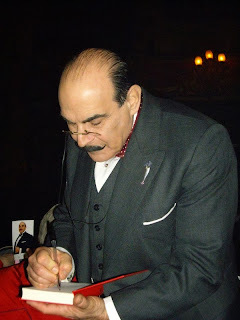 Now, Colonel Race was introduced to the viewers in Death on the Nile as an old and cherished friend of Poirot's. He should also have been in Cards on the Table, but actor James Fox was unavailable to reprise the role. To delete the fake identity and make Colin his son makes absolute sense, and I'm glad the scriptwriters pay attention to continuity every now and then. First promotional photos from 'The Labours of Hercules'! Here are the first promotional photos for The Labours of Hercules. 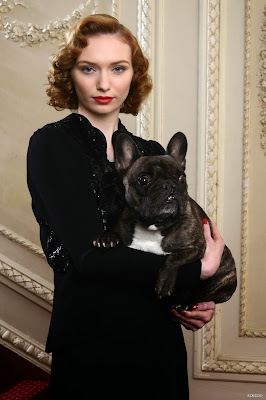 Image source: ETomlinsonCom on Twitter, www.eleanor-tomlinson.com/thumbnails.php?album=110. Photos linked to their source. Copyright ITV. This particular episode is still a mystery in every sense of the word; very little is known about how this collection of short stories will be adapted into one episode. Any thoughts after seeing these photos? 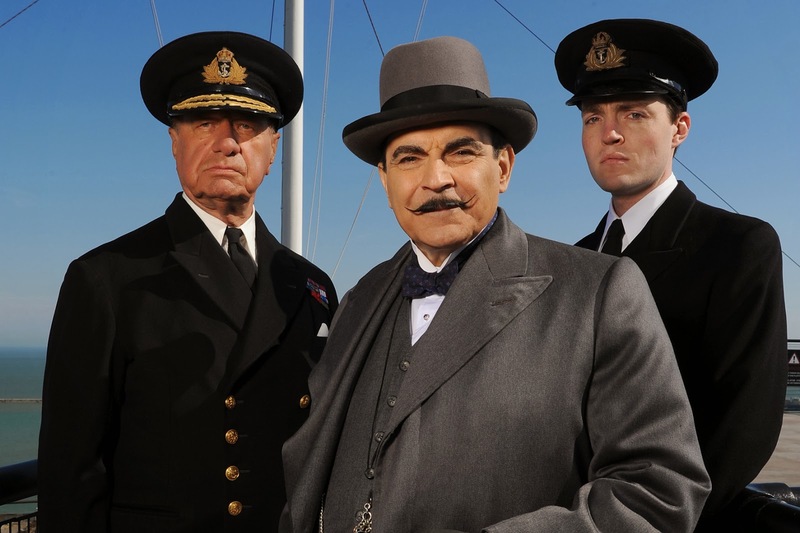 This episode was based on the novel Murder on the Orient Express, first published in 1934. It was adapted for television by Stewart Harcourt and directed by Philip Martin. (Beware of SPOILERS). Opinion is particularly divided on this episode. That is hardly surprising. We are, after all, talking about Christie’s most famous Poirot novel, which just happened to be adapted into an Oscar-winning big screen movie, directed by Sidney Lumet, in 1974. Not to mention the fact that this was one of the most intensely anticipated episodes of the ITV series. With this in mind, Stewart Harcourt faced a near impossible challenge when adapting this novel. How do you adapt one of the most famous crime novels in crime fiction history and avoid comparison with the successful 1974 film? And how do you make exciting television, when most people already know the solution? I’m not an expert on scriptwriting and the adaptation process. But it seems to me that anyone adapting a famous, universally acclaimed masterpiece is faced with two options for, or approaches to, the source material. They can (a) decide to write a plot-centred adaptation, focusing on Christie’s famous ‘puzzle’, or (b) explore the broader themes of the text and emphasise the characters in relation to those themes. Both approaches can be seen in adaptations of a number of famous novels and plays. Anything by Shakespeare is the prime example. In the case of Murder on the Orient Express, Harcourt was faced with some constraints – but also some considerable advantages – that probably had an impact on the choice between these two approaches. I’ll look into these before I come back to Harcourt’s script. 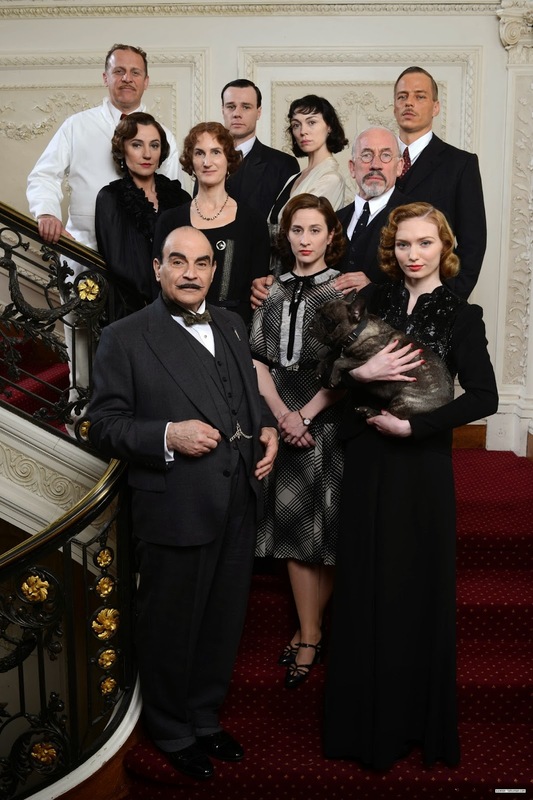 A new Poirot trailer has just been released by ITV, to mark the beginning of the end. It's an incredibly moving trailer, with the voice-over from the final part of Curtain (anyone who has read the book will recognise it), accompanied by clips from several of the episodes, all the way from The Adventure of the Clapham Cook (1989) to what I assume must be Dead Man's Folly (2013) (he's walking between some hedges in a garden, and I don't recognise it from any of the earlier episodes - correct me if I'm wrong). 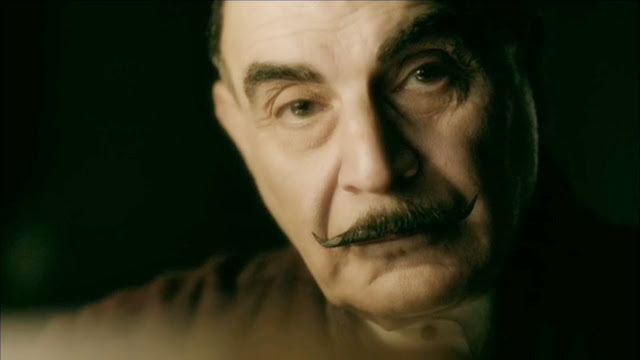 I particularly enjoy the collage of portrait close-ups of Poirot/Suchet towards the end. It's a beautiful to show the evolution, the aging and the development of the character. Top marks to whoever put this thing together. Now, let's speculate. First, we know that The Big Four will air 23rd of October. 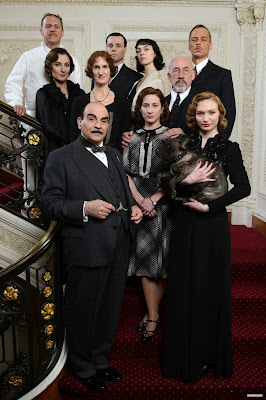 Here's the press pack, which also includes interviews with David Suchet, Philip Jackson and Sarah Parish (Flossie Monro), and the episode trailer. Second, we are told in the trailer that 'the final four cases of Poirot start with The Big Four'. Third, we know that there will be a preview of Dead Man's Folly at the BFI on the 29th of October. The conclusion to be drawn from this (and from certain rumours I've heard the last couple of days) is that we can probably look forward to Dead Man's Folly on the 30th of October, and possibly even The Labours of Hercules on the 6th of November and Curtain on the 13th. If so, we are only a couple of weeks away from The End. In the words of the trailer: UPDATE 15/10: ITV have just announced that 'Dead Man's Folly will be broadcast on Wednesday 30th October 2013! Here's the press pack. Thanks to the anonymous commenter who alerted me. After an incredible journey, the end is near. While we wait for the forthcoming UK broadcast of The Big Four, here are some some set photos and screencaps! 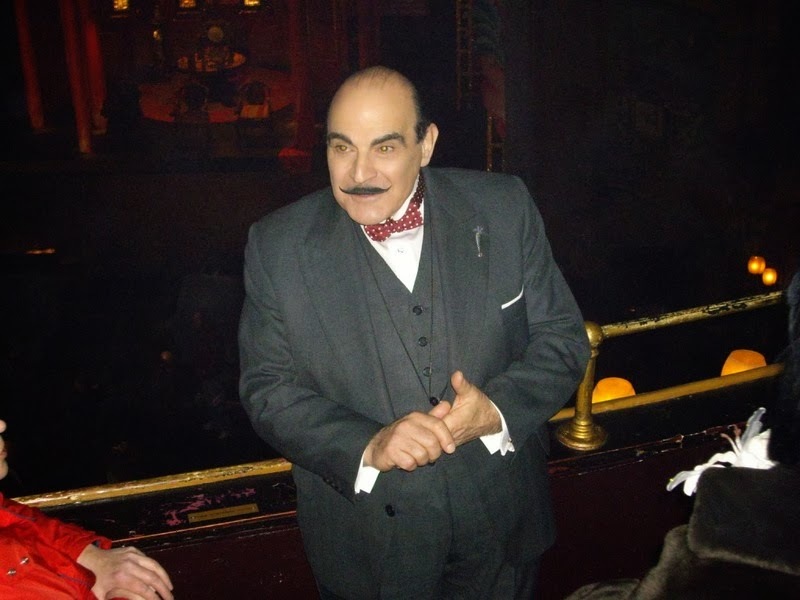 A very eventful (Poirot) autumn! BFI Southbank, 6:20 p.m. Tickets £11. On sale from 8 October. I've mention this before. 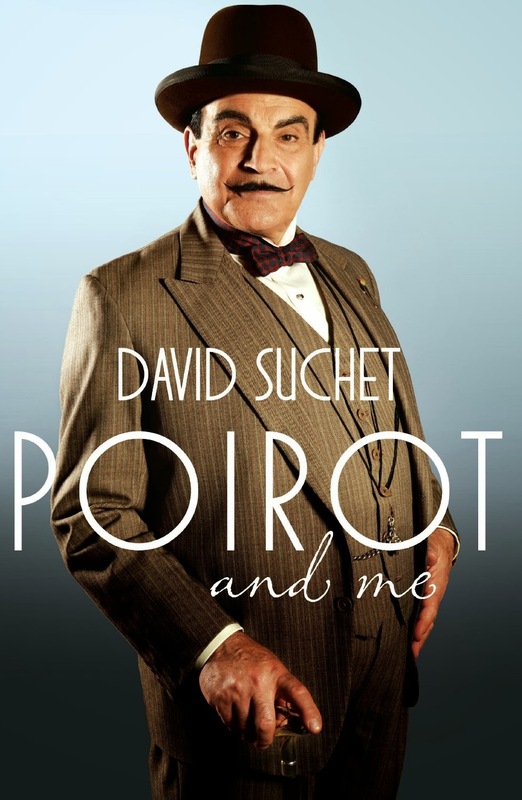 It's (almost) as interesting as the new episodes; David Suchet's story of how he developed the character (plus loads of photos etc.). 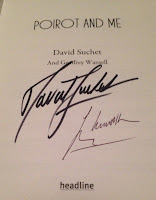 Should be a great Christmas present for any Poirot fan. Next on the list is a promotional tour to coincide with the release of the book. He will visit Theatre Royal Nottingham (7 November), Chepstow Drill Hall (10 November), Chorleywood Memorial Hall (11 November), London/Dulwich (12 November), and finally, Harrogate (10 December). More information here. 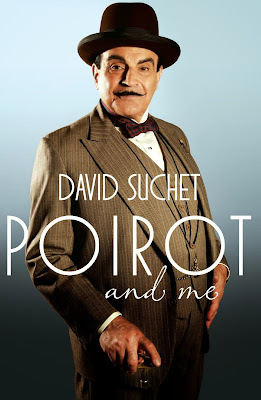 Now, the final track, 'Adieu Poirot' seems to suggest some sort of version of Gunning's theme. 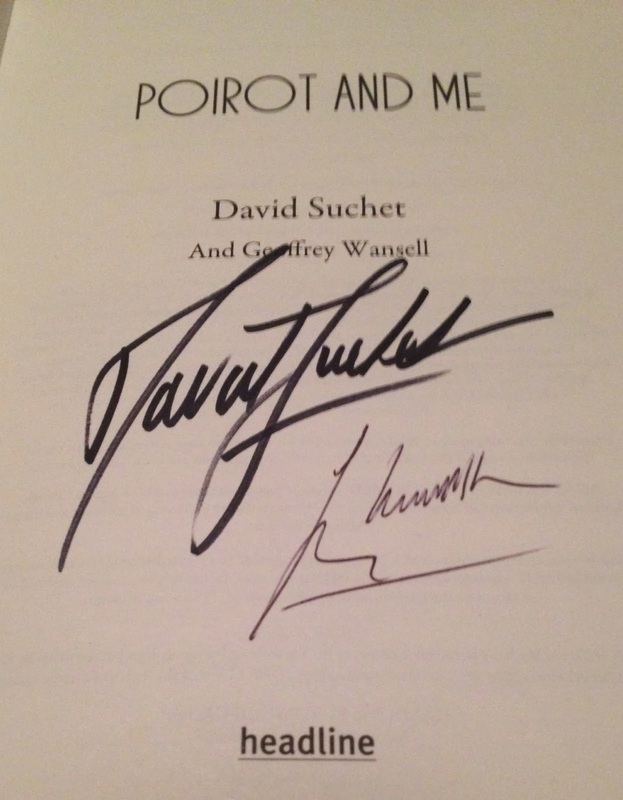 Having searched the Internet for more information, I think this might be 'Adieu Poirot' by Amy Dickson, which is basically a re-recording of Gunning's 'The Belgian Detective'. You can listen to it on Spotify or buy her album on Amazon. But we can't be sure until we've heard the album, I suppose. November/December: Dead Man's Folly, The Big Four, Labours of Hercules? Judging by all of the above, as well as other rumours, I think it's safe to say that the UK will get the next episodes from November onwards. As mentioned, Dead Man's Folly will be the second episode, which means the most likely broadcast order is Dead Man's Folly, The Big Four, Labours of Hercules and finally Curtain. But it would be nice to have a press release from ITV. UPDATE: We now have a press release. And The Big Four will be the second episode to air. This means the most likely broadcast order will be The Big Four, Dead Man's Folly, Labours of Hercules and Curtain. Also, according to play.com, the Collection 9 (Series 13) DVD has an estimated release date; November 18th 2013! If that's correct, we'll get to see the final series a lot sooner than we expected. Thanks to Paul who alerted me to this. The old gang is back - photo released for 'The Big Four'! A big thank you to the anonymous commenter who alerted me - here's the first promotional photo for The Big Four! It's amazing to see the 'Big Four' (Poirot, Hastings, Japp, Miss Lemon) back together again! UPDATE: Commenter "ueetba" just alerted me to two more photos (see below)! This episode was based on the novel Hallowe'en Party, first published in 1969. 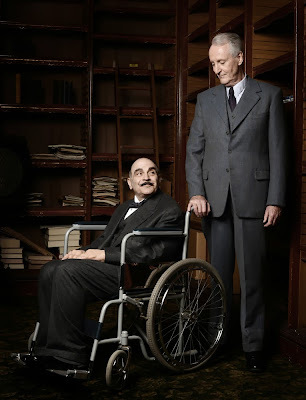 It was adapted for television by Mark Gatiss (who previously scripted Cat Among the Pigeons, acted in Appointment with Death and co-wrote the upcoming The Big Four with Ian Hallard) and directed by Charlie Palmer. Gatiss's script manages to transport the plot from its 1960s setting to the series' 1930s setting almost seamlessly, with the odd fact that Halloween parties in the UK probably were far less common in the 30s. For instance, he removes any references to LSD and other drugs. 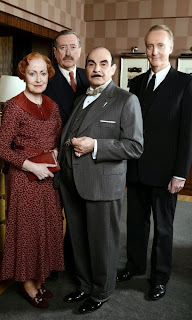 As to changes to the plot, he removes a couple of characters, most notably Superintendent Spence and his sister Elspeth McKay, but also Ann Reynolds, Dr Ferguson, Harriet Leaman (the cleaner), Miss Emlyn, and the boys, Nicholas Ransom and Desmond Holland. 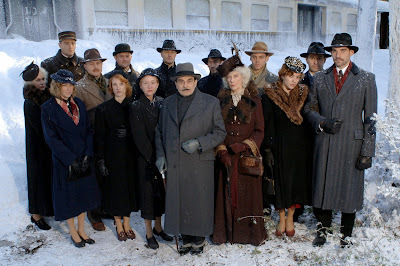 It would be nice to have Spence included, particularly since he was present in the two previous novels he was in (Taken at the Flood and Mrs McGinty's Dead), but I suppose he felt there would be too many investigators on the case (Poirot, Mrs Oliver, the local police and a retired Spence). The other characters are minor and consequently their removal matters little to the plot. Gatiss adds a couple of new characters, i.e. two grown-up children for Mrs Drake (Edmund and Frances). He makes Mrs Reynolds a step-mother to her children. Also, Mrs Goodbody (the local 'witch') fittingly replaces Elspeth as the local gossip from whom Poirot gets his information on the suspicious deaths (one suspicious death, Charlotte Benfield, is removed). Moreover, the Jane White (Beatrice in the adaptation) death is given a somewhat different backstory (or, perhaps I should say, a more outspoken one). The character of Ambrose is deleted, so Beatrice White is revealed to have been in love with Miss Whittaker (who is a church organist, not a teacher here). Some viewers have reacted to the more upfront display of homosexuality, but I think it's been beautifully done in a very touching scene by the lake where she drowned (as an aside, this is the only Christie novel in which the word 'lesbian' is used). Furthermore, Lesley Ferrier was seeing Frances Drake rather than Nora Ambrose. Also, the reverend gets a more central role, with an au pair scheme to help girls like Olga (making him a potential suspect). 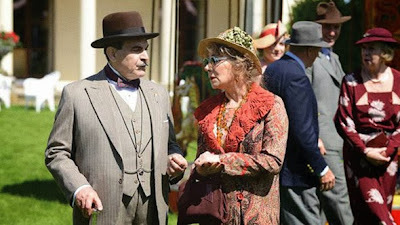 Of minor changes, Mrs Oliver is down with a flu for most of the episode (I'm not sure if that's supposed to add comedy to the proceedings or if it was a result of Zoë Wanamaker's availability), Poirot arrives on the train together with Michael Garfield (who has just arrived from Greece), Poirot doesn't stay at a guest house but at Mrs Butler's house, Mrs Drake's husband was killed by what seems like a hit-and-run accident, and several horror and spookiness references are added, e.g. to Edgar Allan Poe and Matthew Hopkins (probably a result of Gatiss being a big horror fan). 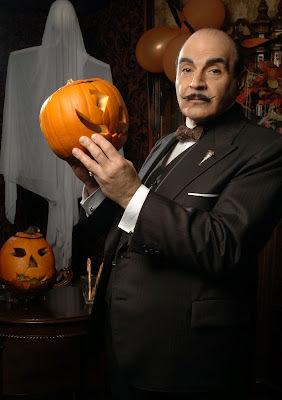 Poirot, obviously, dislikes the tradition of reading horror stories around Halloween (he prefers remembering the dead).All in all, Gatiss's adaptation works well, and it's a more or less faithful retelling of the novel. Palmer's direction suits the episode. He has emphasised the darkness and autumn colours of the season. Also, I particularly like the use of the snap-dragon game, which I assume is partly Gatiss's and partly Palmer's idea. This brings to mind other adaptations that revolve around games and rhymes, like One, Two, Buckle My Shoe and 'How Does Your Garden Grow?'. 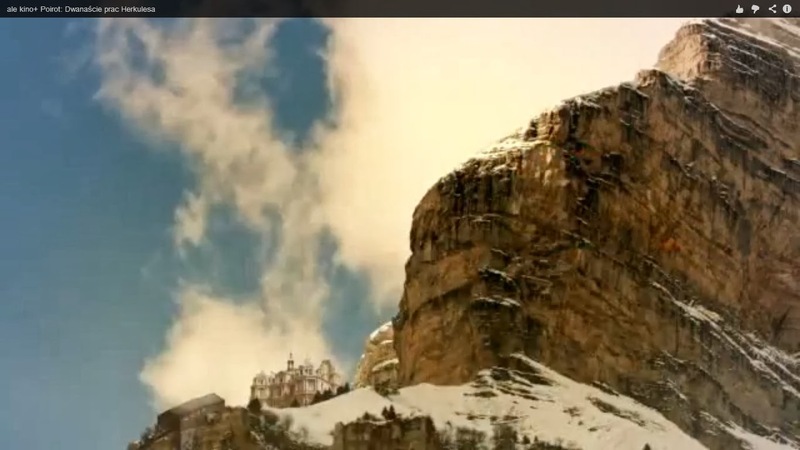 The production design also suits the episode, again with an emphasis on the season. The main location is a private estate in Oxfordshire. The soundtrack works particularly well for the episode. Composer Christian Henson emphasises the snap-dragon game in collaboration with Palmer and Gatiss. It's always a joy to see David Suchet and Zoë Wanamaker together as Poirot and Mrs Oliver. They really have excellent screen chemistry. A shame that Mrs Oliver is bedridden for most of the episode, though. Poirot is in investigation mode in this story, even if faced with opposition from the local police. Also, it's good to see George back in the fold, too. Of the other actors, Deborah Findlay and Julian Rhind-Tutt both stand out, but I think particular credit should go to Mary Higgins, who plays Miranda.